I am a keen photographer that enjoys the great outdoors. Here you will find a collection of my work that I have taken over the last few years. I enjoy the outdoors and have mainly taken landscape, seascape, sunset and wildlife pictures. My wife and three sons, enjoy taking pictures as well. 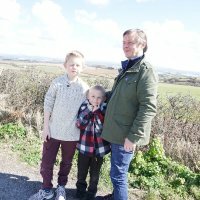 As a family we enjoy sharing adventures and we'd like to share some here too. Hi i'm jon and i'm pictured below with my boys. As a family we love days out together. I love adventure, engineering and photography. Link text here...A cloudy, windy picnic on Dartmoor.